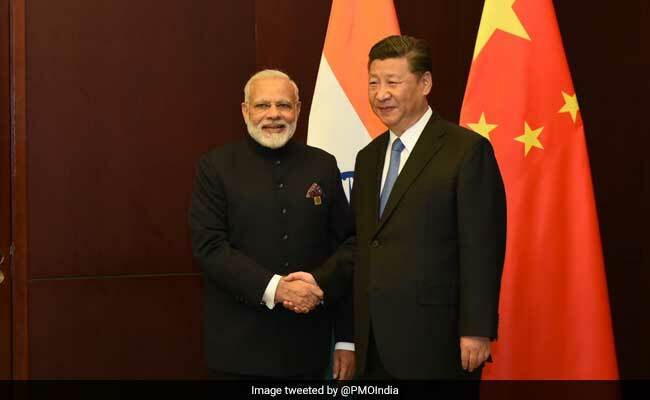 The meeting between PM Narendra Modi and Xi Jinping at the Shanghai Cooperation Organisation (SCO) summit assumes significance as India recently boycotted the OBOR forum in Beijing. PM Narendra Modi with Chinese President Xi Jinping at the SCO summit in Astana. Prime Minister Narendra Modi today met Chinese President Xi Jinping on the sidelines of the Shanghai Cooperation Organisation summit in Astana amid growing differences between the two countries over a host of issues, including the China-Pakistan Economic Corridor and India's bid to enter the Nuclear Suppliers Group. "We spoke about India-China relations and how to further improve ties," PM Modi tweeted today after meeting with Mr Jinping, who is also the general secretary of the ruling Communist Party of China. PM Modi arrived in the Kazakh capital yesterday on a two-day visit to attend the SCO summit where India and Pakistan will be inducted as full members of the bloc. "PM @narendramodi meets President of China #XiJinping on margins of SCO Summit in Astana," External Affairs Ministry Spokesperson Gopal Baglay tweeted today. The meeting between PM Modi and Mr Jinping assumes significance as it took place after India boycotted the Belt and Road Forum in Beijing last month where 29 world leaders participated. India abstained from the summit to highlight concerns over the $50 billion CPEC, which is part of the 'One Belt, One Road' or OBOR project that passes through Gilgit and Baltistan in Pakistan-occupied Kashmir. China is vocal about its stand to block India's admission into the 48-member NSG. It is also against India's move to get Jaish-e-Mohammed leader Masood Azhar listed as a terrorist by the United Nations. After Astana, PM Modi and Mr Jinping are likely to meet at the G20 summit to be held next month in Hamburg in Germany, followed by the Brazil, Russia, India, China and South Africa or BRICS summit to be held in Xiamen, China in September. PM Modi also met Uzbek President Shavkat Mirziyoyev on the sidelines of the SCO summit. "Taking forward #IndiaUzbekistan coop'n. PM @narendramodi meets President Shavkat Mirziyoyev of Uzbekistan on the sidelines of SCO Summit," Mr Baglay tweeted.